Dennis J. Picard was recently elected as Raytheon Company's next president by the diversified electronic company's board of direc- tors. Mr. Picard, currently senior vice president and general manager of Raytheon's Missile Systems Divi- sion, Bedford, Mass., will replace company president R. Gene Shel- ley, who is retiring August 1, 1989. The board also expanded the number of directors from 13 to 14 and elected Mr. Picard to the board, effective immediately. CEO since 1975, extend his service with the company until December 31,1990. Mr. Phillips has agreed to the board's request. John P. Shanley, vice president and assistant general manager for programs at the Missile Systems Di- vision, would replace Mr. Picard as general manager of the division. Inc., Brownsville, Pa., a shipbuilder which has constructed 4,000 barges since its founding in 1938. Terms of the sale were not disclosed. Trinity Marine Group, New Or- leans, La. The barge builder has covered facilities for year-round construction and a 300-foot marine railway for vessel repair. Trinity Marine Group, said, "We are pleased to acquire HBC because of its excellent reputation for build- ing high quality barges and because the acquisition will make us more competitive in obtaining contracts for barges which will operate on the upper Mississippi River and its tri- butaries." He added that HBC will continue to be operated by its current man- agement and no major changes are anticipated. HBC currently has a backlog of 115 barges. It builds hopper barges and tank barges, and has built tug and push boats. Best known for its 195-foot coal barges, HBC can con- struct vessels up to 300 feet. HBC is also known for technical innovation in design and production including an automatic welding technique which eliminates the vari- ability of man-made plug welds. Mr.
Machine Iron Works, Inc., Alumi- num Boats, Inc., and recently ac- quired Thunderbolt Shipbuilding and Repair, Inc.
A $12.6-million ferry is being planned by Sealink British Ferries for service to the Isle of Wight. An order for the ferry, which will have capacity for 1,000 passengers and 140 cars or freight equivalent, is expected to be placed this spring. 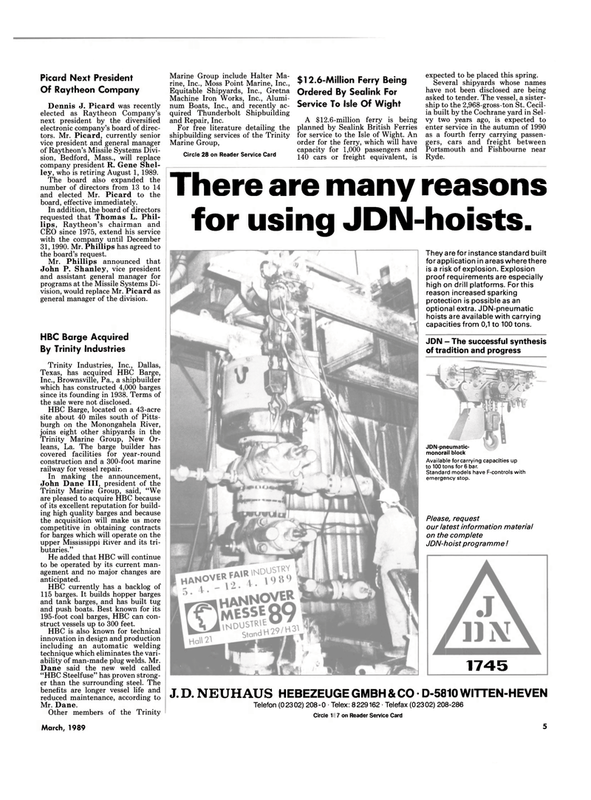 There are many reasons for using JDN-hoists. They are for instance standard built forapplication in areas where there is a risk of explosion. Explosion proof requirements are especially high on drill platforms. For this reason increased sparking protection is possible as an optional extra. JDN-pneumatic hoists are available with carrying capacities from 0,1 to 100 tons. Available forcarrying capacities up to 100 tons for 6 bar. Standard models have F-controls with emergency stop.